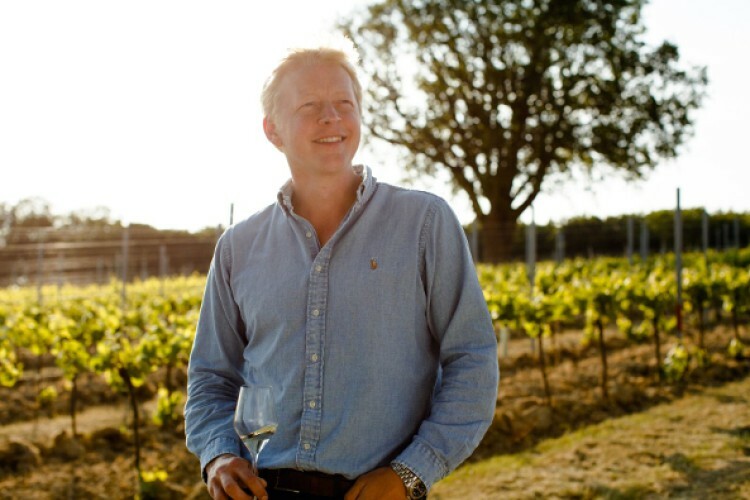 2018 was an incredibly busy year for Ben Walgate, winemaker and co-founder of Tillingham. 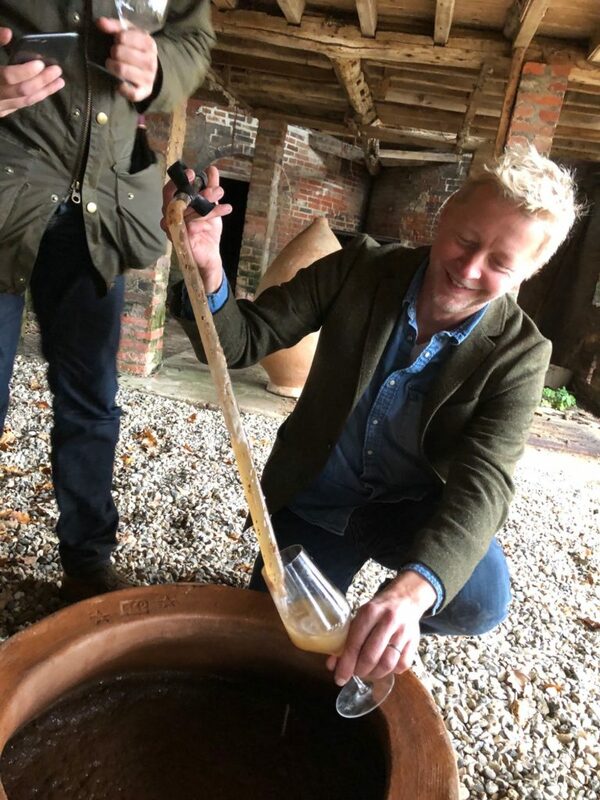 They launched their first wines onto the UK market, planted 10,000 vines by hand at their farm in Peasmarsh near Rye in East Sussex (the fruits of which will see the light of day in 2021), took part in the biggest and best harvest probably in UK history, and began work on converting the farm outbuildings into a fully functioning winery, rooms, restaurant and shop (amongst other things). 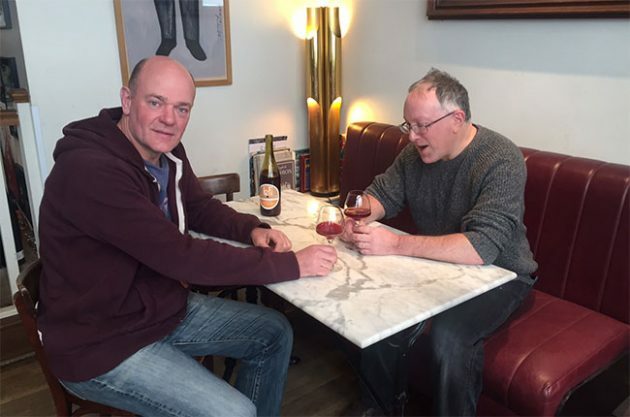 Here Doug Wregg from its UK distributor, Les Caves de Pyrene, reports from his latest visit to the winery. 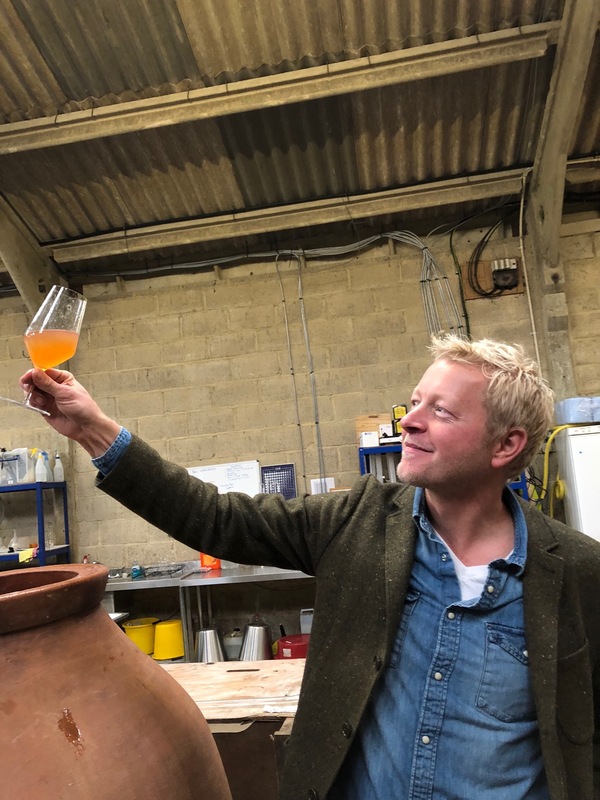 As we join Ben Walgate in 2019, three new wines are about to hit the market and he has begun to issue details of an investment bond for Tillingham to take the project to the next level. The wines, meanwhile, go from strength to strength with demand already from several foreign markets. It was a busy year for Tillingham Wines in 2018, planting vines and renovating the various farm buildings. Did you achieve everything you set out to? Put simply, yes. Though nothing really went to plan! The vine planting, for example, was a learning curve. I wanted to try out some new (old) ideas, like hand-planting all 10,000 vines with minimal tillage: a proper melting pot of the ancient and the latest in approaches to farming, and doing this all whilst using a biodynamic/natural methodology. Then the weather threw us a massive curve ball, with zero rain for over two months after planting. The hot summer also caught us out by ensuring that harvest started crazy-early on September 3 – a record for England. Although all our new winery equipment and new qvevri weren’t scheduled to arrive until early September, we had just enough kit to get going, and with our low intervention approach, we managed to scrape by. How pleased are you with the reception to the wines in the trade? More than pleased: overwhelmed and humbled! When I was planning Tillingham, I didn’t have the self-belief that I could be the winemaker. In hindsight, it couldn’t have been any other way. 2017 was my first vintage making wine using a low-intervention approach and from bought-in grapes too. I have been so fortunate that the wines have all behaved themselves and been so well-received. What is the inspiration for your new wine called “Col” (first released in December 2018)? I had 3,000 litres of my sparkling base wine ready to be bottled using the traditional method. I was really pleased with it, and as soon as I had made the assemblage (blend) in January, I began thinking ahead to bottling and tirage, I was concerned about tying up the wine in lees-ageing for two to three years. The inspiration came when I went to Venice for a long weekend, and tasted a few Col Fòndo style Proseccos. I loved the slightly sour quality, the hint of wildness and rawness in these wines. The decision was made then and there. I ended up dividing the 3,000 litres into three parts, two of Col Fòndo / ancestral method wines and one of traditional method. How do you decide which grapes to put into qvevri, which into tank and which into barrel? Mainly gut feel. I started harvest with a rough idea about what I wanted to do: more of the same for the wines that I wanted to recreate from 2017, combined with new varieties and new styles that I wanted to try. When you’re taking a low intervention approach you are intrinsically responding to the quality of the grapes and thus you have to be prepared to adapt. The type of vessel you make the wine in, alters the wine; it can be remedial also. Oak and clay are transformative. How are the ferments for the 2018s going? All ferments are non-inoculated and wild. We worked with 11 vineyards this year and 13 different varieties. It was interesting to see how the ferments behaved, how long it took them to start, how warm they got, how long they lasted etc. The idea behind such natural ferments being that the yeast populations on the fruit are vineyard-specific, and are therefore going to be subtly different, with certain similarities between batches of fruit from the same vineyard. All ferments, in the end, were happy ones, with no problems nor stuck fermentations. How do the qvevri ferments compare to the others? For two successive vintages now, having fermented the same juice in steel, clay and oak respectively, I have been able to witness the clear differences within a week. The same general rules of ferment hold true, though clay and oak tend to ferment to dryness in less time. The colour is different for a start; flavour and texture are also noticeably distinctive. I understand some of what’s going on here, but some of it seems to run counter to received wisdom, and you just have to go with it. I love the complexity and depth that these qvevri bring to the wines though. Please describe your qvevri “cellar”. What are these vessels like to work with – any problems/discoveries/need-to-know bits of advice? 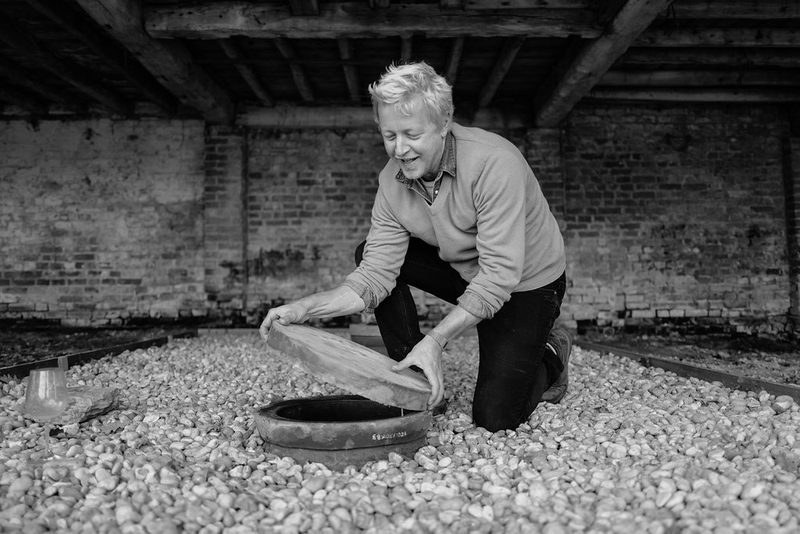 We have 14 qvevri here, the majority buried in the ground under a traditional Kentish oast house and a few free-standing ones in the winery. Qvevri are traditionally cleaned with just water and elbow grease. Ours are all pretty small (400-litre), the biggest being 800 litres, so they’re too small to climb into and too big to be able to reach the bottom. Working with qvevri has been revelatory and made me look to our wider practices, especially regarding sanitation in the winery. 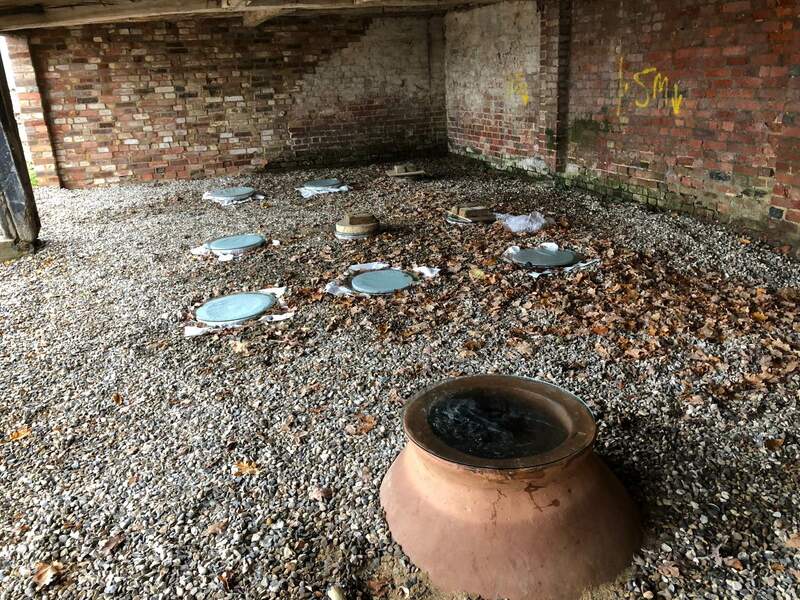 Qvevri, and barrels for that matter, are never cleaned with chemicals, sometimes just a sulphur wick, yet practically everything else in the winery is sterilised. Since our whole natural approach from farming to winemaking is reliant on healthy microbes, it seems to be counterintuitive to be creating an artificially sterile environment. Skin contact whites – which grape varieties respond well to maceration on skins? What, in your opinion, determines the ideal length of the maceration, or the proportion of grape-skins to juice? Ask me again in a couple of years! I’m still trying new things. In this vintage (2018) six of the eight white varieties were kept on skins from anywhere between 24 hours to three weeks. Some are still on skins now. The aromatic varieties need less contact, but it seems to really suit the style. Chardonnay has been a revelation; the added texture is really exciting. Decision-making process is mostly gut feeling, but also based on taste. If I feel like going long on the maceration, I will decrease the skin ratio to around 20% to 30%. I like the authenticity of 100% skins with several week maceration (subject to varietal), though I’m open to trialling a much longer period of maceration in the future. 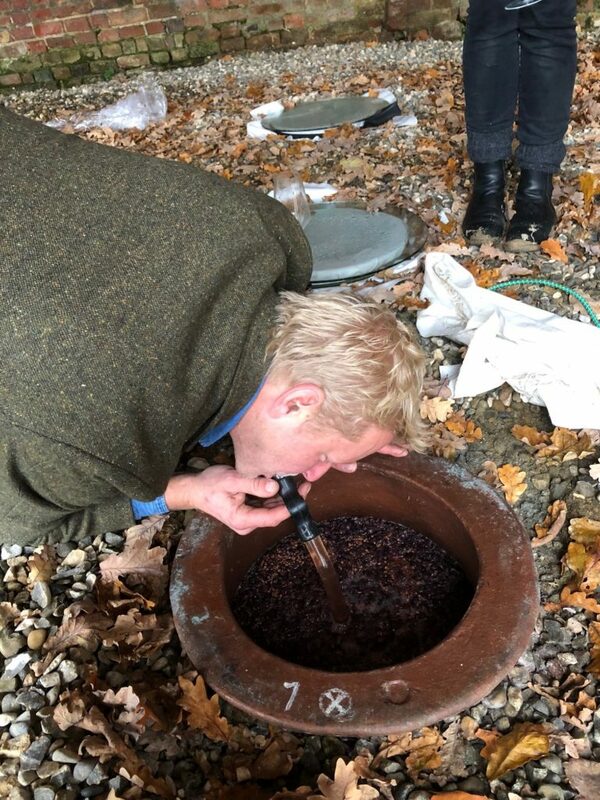 In the 2017 you made your first Tillingham still wine called “Artego” in one of the Georgian qvevris. Can you summarise the process and any difficulties you experienced? How has the wine developed in bottle over the year? The Ortega grapes were destemmed and macerated for five days prior to filling the qvevri. This was my first skin-contact wine. I wanted to leave this wine in the ground for six months or so, and worried about picking up too much bitterness from skins and pips, I reduced the skin to juice ratio to about 20%. I sealed a wooden lid with clay, which as it happened had a major outcome on the wine. Despite resealing with fresh clay several times, there was a lot of oxidation and a thick flor developed. After seven months there was too much oxidative character for my taste, however, when I duly emptied the qvevri and pressed the skins, the pressings and lees completely transformed and restored the wine! Bottled with only 10 days settling and no filtration or sulphur, I was initially worried how the wine would develop in bottle. I shouldn’t have, the wine was – and is- incredibly resilient, and is developing into something new and even better as we speak. Wish I had kept more back! You have tanks, barrels, qvevris and even a German foudre – are there any other vessels that you would like to work with that you don’t have at the moment? Concrete. I visited the Nomblot factory in Burgundy a couple of years back, I’ve always wanted to work with concrete and I’ve just been waiting for the right time (and to have enough money) to make that investment. You were working with some new vineyards in the 18 vintage. Any surprises in terms of the quality of grapes that they yielded? The quality across the board was like nothing I’ve ever seen in England. Two new vineyards of note include a certified organic, and a biodynamic, grower. The wine from these vineyards will be in our next bottling, and I’m very excited about that. The other was a grower in the Thames estuary. The fruit was unbelievable. Both the Pinot Blanc and Pinot Noir from that site took around 10 weeks to ferment, resulting in the most incredible flavours and texture. Two wines are being released at the beginning of 2019. Can you tell us about them? The ‘R’ is my take on a “Bojo Nouveau”; being a carbonic maceration red, which is pressed very early and fermented in a free standing qvevri. The wine was then gravity bottled with no filtration or sulphur. It’s super juicy, fruity and fresh. I am thrilled with it and can’t wait to make more. The other is the Pét Nat, PN18, which is along the same lines as the PN17, but there are more varieties in there, with added depth through greater skin contact. How many wines are you intending to release during 2019? A bit early to say, but maybe up to 14 wines this year. Would you say that you are working for texture rather than aromatics in your wines? We have a super-long growing season in the UK which is a huge boon for aromatics. Getting the optimum level of ripeness to achieve the maximum textural quality is a challenge. Natural winemaking with its elements of skin contact, zero sulphur/wild ferment, lee-ageing etc. all encourage and safeguard texture in the wine. Do you think making wines without filtration – and with low to no added sulphur – has helped to establish the style of the wines? My view of my wines is inherently very different to anyone else’s. I don’t notice a style, but I would be fascinated to know what others think. Filtration can strip texture and flavour and sulphur will mute it further. There are advantages to both filtration and sulphur, but for me the integrity and additional weight of the wines that come from avoiding these interventions is my preference. Are all your sparkling wines made without dosage? What quality do you need in the wine in order to make zero-dosage wines? I made one traditional method sparkling from 2017, but it’s a couple of years away from disgorging and dosage. It certainly possesses low enough acidity and enough weight and substance that it could be a zero-dosage wine. The key is balance, of course. Zero dosage sparkling wines are trendy, but trendy’s no good if you can only stomach one glass of it. Not many producers in the UK focus on still wines. Why do you think that is? There are a number of reasons. Firstly, the quality of English still wines has never been that high. This is partly for climatic reasons, but also due to the belt-and-braces conventional approach to the winemaking, which often results in pretty, but often fairly thin still wines. English sparkling wines, on the other hand, are, on the whole, as good as entry level champagne, and with the benefit of the patriotic/novelty factor, have enjoyed a very premium price position which, in turn, has led to a lot of people investing vast fortunes in sparkling wine production. 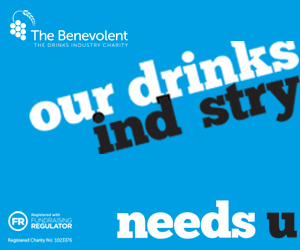 There is great potential in the UK for exceptional quality still and sparkling wines. Which grape variety that you have thus far worked with has surprised you? In what way? We have written off and grubbed up so many varieties in this country. Some of the best wines in the winery, or biggest surprises, are grapes like Regent or Müller-Thurgau, either unheard of or maligned, but, when approached in the low-intervention style, can be so rewarding and easy to work with. Tell us about the range of grape varieties you planted in 2018 on the Tillingham farm? How did that go? How have you been setting up the vineyard. Any problems? We planted 20 permutations of varieties / clones of varieties. Majoring on things I like, and that I know will work: Pinot Noir, Chardonnay, Meunier, Ortega, then a smattering of aromatic and Germanic vinifera crosses: Bacchus, Siegerebe etc. Some Gamay and Chenin, Pinot Gris. Drought was our biggest issue in 2018, with some above average losses in areas where water was less available. And what will you be planting in 2019? More of the same, taking the numbers of each variety up to levels where we will have significant volumes to work with in the winery. I’m including a couple of hybrids, which I never thought I would, but due to the results we’ve seen in the winery, and testimony from other growers, it’s a no-brainer. I’m still looking to experiment and plant more classics such as Pineau d’Aunis, Trousseau, Gamay and Auxerrois. How many acres/hectares will be planted to vines in total? And what will the rest of the farmland consist of? We’ll have about 10 hectares when we’re finished planting. The rest will be a mixture of grazing and fruit trees and a nursery for the plants we will use for tisanes and preps for the vines and soil. Tell us about the biodynamic preps you are using? When do you apply them? At present, we are only using the compost preps and horn manure to treat the soil. We use the horn manure in the autumn and then again in the spring. Once the vines are mature enough, we can look to use horn silica. The last two vintages we have mixed the grapes skins and stalks with farmyard manure, woodchip and straw to compost and use as an under-vine mulch. Eventually, when the vineyards yield grapes, (when are you expecting your first vintage?) how many bottles will be coming (roughly) from your home vineyards? All being well, these 10 hectares will produce about 60,000 bottles. We’re not expecting the biggest yields, but hope that through all the work we’re doing to restore the soils and promote biodiversity through habitat creation, that by 2021 (when we have our first vintage), we’ll have something very interesting to work with. Do you think more English vine growers might be persuaded to go down the organic/biodynamic farming path? What is preventing them from doing so at the moment? Fear of the unknown, resulting from a prevailing misconception that the UK is a more challenging climate for growing grapes in, hence we should be more reliant on chemicals in the vineyard. From my perspective, the attraction of biodynamics and more reasoned responsive farming, is that it works with nature to boost the microbial populations in the soil, and in general encourage and restore the kind of environmental services that support both immune response and nutrition in the vine. You may still need to spray, yet by embracing this approach, the vine and the system as a whole, is inherently more resilient. 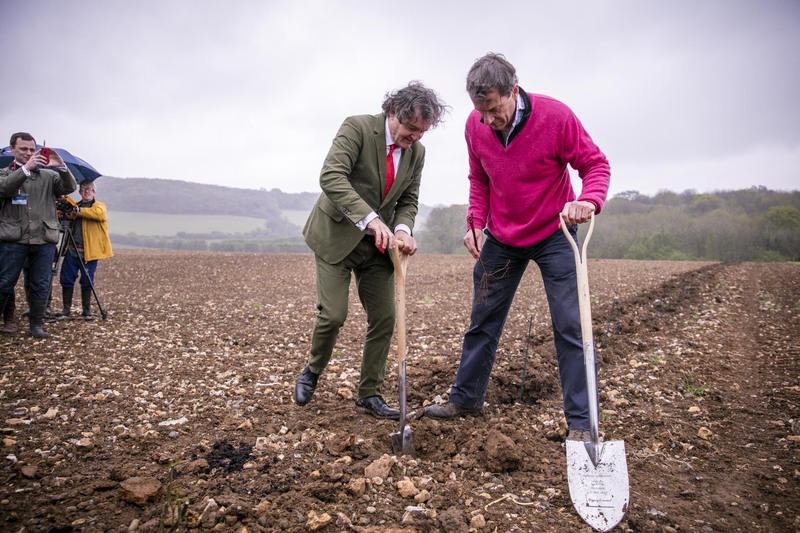 Why do you think that there has been so much investment in planting and infrastructure with a consequent growth in the English wine industry? The sparkling bubble (as it were) is still pulling people in on the lure of premium prices and the relative ease of production. There’s up to an eight year wait from planting to selling your first bottle of traditional method sparkling. Many people are still piling in, as the tsunami of, let’s be honest, solid but unremarkable bubbles, is still to hit and the romance and hubris of it all remains unsullied. There is a very bright future for English wine and wine tourism. Sparkling wine will no doubt do all the heavy lifting, though it is inevitable that there will be some consolidation in the industry at some point. Which wines that you have drunk over the last year have particularly inspired you? Austria (mainly whites) and the Jura (whites and reds) have been blowing me away consistently with their mixture of beguiling, textural and pretty wines. I wish I had more time to visit these regions and learn more. What is the immediate programme for rest of the farm and outbuildings? 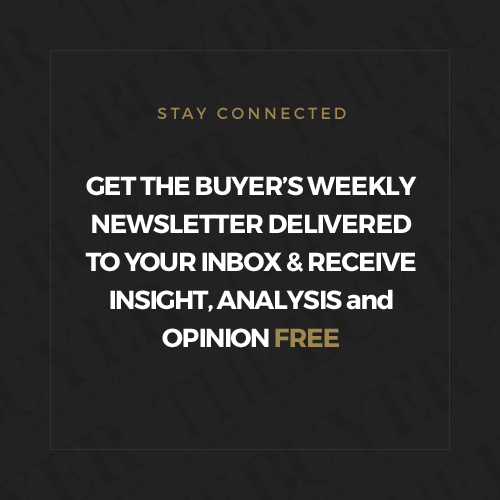 Tell us about the different elements of the business which are being developed in 2019. 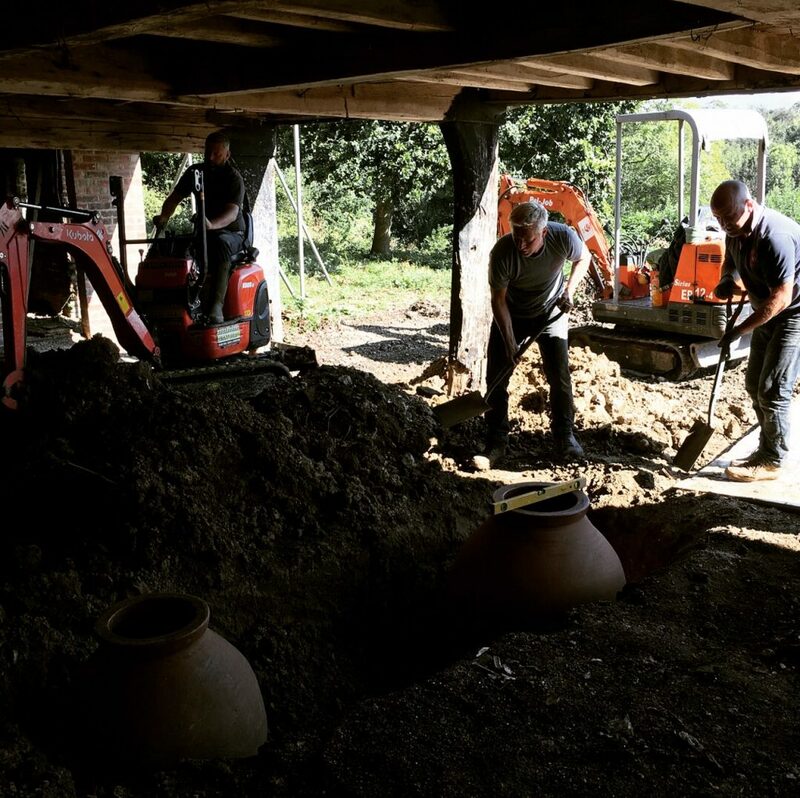 Since September, we have been transforming the farm buildings, into rooms, a restaurant, tasting room, shop, kitchen garden, outdoor pizza oven and grill, alongside a brand-new winery and other production buildings. The build finishes by the end of March, with landscaping, planting and fit out taking us through to May. I hope we will be in a position to open for the summer, but in order to do so we will need both further investment and great people to get on board to manage the project. We’ll be launching the Tillingham Bond shortly, which is a 5-year advance purchase scheme which provides us with some cash in order to grow our business, whist guaranteeing the bond holder a fixed allocation of wine and exclusive access to Tillingham. Tillingham Wines are available through Les Caves de Pyrene and will be at The Real Wine Fair at London’s Tobacco Dock on May 12th and May 13th.